PREPARED FOR: F. D. Deskins, Inc.
retrofitted), a belt filter press dewatering system, and a centrifuge dewatering system. include significant supply chain GHG emissions and GHG emissions during construction. PAS-2050, Bilan Carbone, and other global standards but not entirely equivalent. building footprint associated with each module. with all construction activities required to produce the completed facility. interpretation are all contained to the greenhouse gas module discussed below. accordance with the scope of work of this project. CO2e allows for the simplest calculation of total GHG emissions. emissions by many reporting protocols. emissions in most reporting protocols. these emissions as a part of their inventory. require any documentation or supporting data regarding these emissions. the assumptions for vehicle fuel economy are summarized in Exhibit 2. Note: All distances are one way, not roundtrip. Roundtrip distances are accounted for in the module. types of soil. These assumptions are listed below in Exhibit 4. GHG emissions and were considered equal for the three biosolids dewatering alternatives. as a fertilizer/soil conditioner versus disposed of in a landfill. Module, Indirect Emissions from Purchases/Sales of Electricity and Steam, June 2008.
the production of chemicals associated with these proposed facilities are listed in Exhibit 6. Treatment Plants in the U.S., Malavika Tripathi, April 2007.
and 20 MGD - were evaluated for each dewatering system. 2. A 40:60 ratio of primary to secondary waste activated sludge. 8. A class “B” biosolids product was achieved from the anaerobic digestion process. assumed for belt filter press and centrifuge equipment. 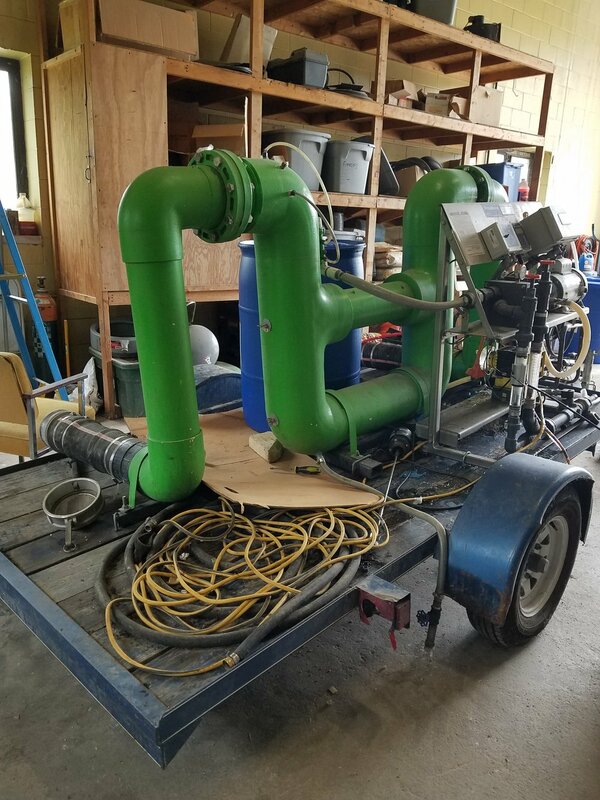 The design criteria for the centrifuge biosolids dewatering system are shown in Exhibit 9.
system is shown in Exhibit 11.
added to the GHG emissions from the annual O&M activities. and heat, cool, ventilate and illuminate the polymer storage and feed building. O&M activities for the three capacity scenarios for the BFP system is shown in Exhibit 13.
generation become a smaller percentage (57 percent) of the overall GHG emissions. emissions associated with polymer use. construction activities, and 2) GHG Emissions from annual O & M activities. 80,000 square feet, are required for the 5, 10 and 20 MGD WWTP scenarios, respectively. when compared to belt filter presses and centrifuges. (structural excavation, backfill and slab thickness) are less. emissions from one-time construction activities. O & M activities for 5, 10, and 20 MGD WWTPs. dewatering buildings for the belt filter press and the centrifuge alternatives are significant. electrical power is required for the Deskins filter bed system. approximately equal or less for the Deskins filter bed system. letter report is to be distributed as a complete document. Let's clear a few things up! We are NOT traditional sand drying beds. As Product Manager for Deskins, I have heard it said in the field a plethora of times the following statements- “sand drying beds are archaic”, “sand drying beds aren’t efficient”, “what happens if it rains?”, “I can’t reclaim water”, “sand drying beds are labor intensive” or “sand drying beds take forever to dry”. We are NOT traditional sand drying beds. I will pick apart each of these statements and tell you how we differentiate. “Sand drying beds are archaic.”- This is true but we do not work in the same fashion. · Due to our patented process of utilizing drainage vs. sun/environmental evaporation, we have sludge cracking in some cases in a manner of a little over an hour see pic below. Cracking of sludge in a hour and a half. This is how we dry compare to traditional sand drying bed. “Sand drying beds aren’t efficient.”-Only partially true because this statement is only anecdotal in nature. Sand drying beds can be effective when relegated to certain geographical area where sunlight is abundant and rain are limited under the close supervision of a good operator. However, even under perfect conditions for a sand drying bed will routinely be outperformed by Deskins. A Deskins Quick-Dry Filter Bed can still produce better sludge and provide water reclamation (98.5% of water for reuse). The benchmark of our success is that we execute with drainage instead of evaporation. Within a little as an hour and a half, sludge on a Deskins Quick-Dry Filter can already be cracking. We work under in the rainiest season in decades when used in Australia. Click here to view the report. “What happens if it rains?”- This is another way Deskins Quick-Dry Filter Beds differentiate from traditional sand drying beds. Due to our patented sludge preconditioning process with our very own RapidFloc Mixer, sludge and polymer are combined efficiently enabling water to release quickly. When the sludge is formed with the polymer and is applied to a Deskins Quick-Dry Filter a sheen forms covering the sludge. This sheen creates a Rain-ex effect similar to a car windshield when rain hits it. The rain then simply slides over the already cracked-drained sludge and falls between the cracks. As stated above, a paper was presented in Australia and was described in the paper of the year at the conference. “I can’t reclaim water.”-With our Deskins Quick-Dry Filter Bed process, Clovis WTP saved 12.5 billion gallons of water in 12 years. Click on video below. “Sand drying beds are labor intensive.” -Yes, they are but the Deskins patented sludge removal process makes removing sludge easy. This process requires a median range of 45 minutes per week for a 40x80 foot bed. Oh yeah, one more thing with our Deskins Quick-Dry patented technology only 2” inches of sand needs to be replaced per year! “Sand drying beds take forever to dry.”-Once again, not always the case due to certain factors. 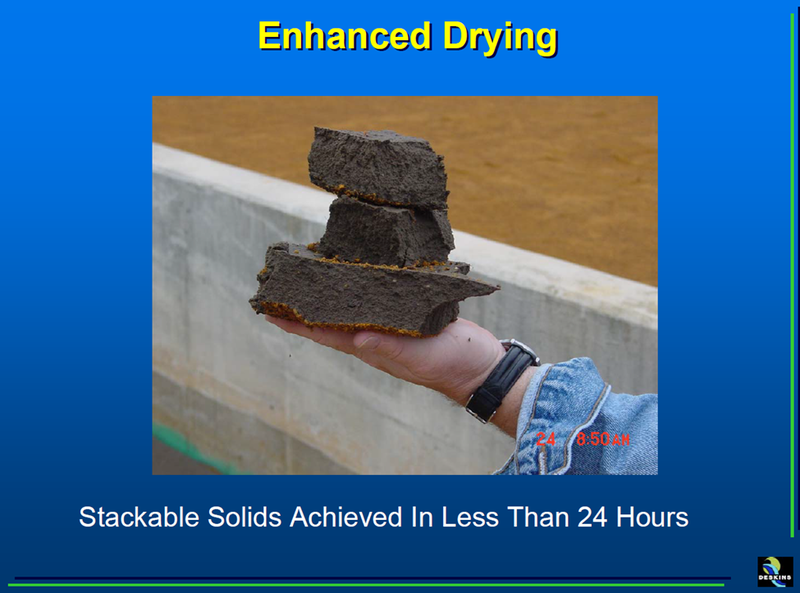 Did I mention Deskins Quick-Dry Filters are not traditional sand drying beds? See chart below created by the EPA to see how we stack up. Typically, we can get sludge dried in 7-10 days. With over 100 installs worldwide, Deskins has proven over time to be a great alternative to mechanical or non mechanical dewatering modalities. Some installs are over 20 years old. Also, Deskins Quick-Dry Filters can be a simple retrofit for existing sand drying beds. One more thing…………….We are NOT traditional sand drying beds. The Deskins RapidFloc Mixer: Timeless and efficient technology. The Occam's Razor for sludge preconditioning! Many of Deskins' RapidFloc installations are still in operation to this day from over 25 years ago. One of these sites is in Winchester, IN with the same RapidFloc being utilized dating back to 1993. Being a steward of sustainable solutions, Dave Deskins, CEO of Deskins, wanted to create a product that contained no planned obsolescence. At Deskins, we create and utilize energy from natural laws of fluid dynamics. In other words, we utilize the natural laws the creator has instilled in nature. This is why our technology has worked for over 25 years on centrifuges, screw presses, belt presses and our very own Deskins Quick-Dry Filter Bed System. The RapidFloc Mixer utilizes the laws of physics, fluid dynamics and fluid mechanics to its full advantage. It is superior over traditional static mixers and lever action weighted valves because of its limited headloss and its ability to recirculate the polymer for more sludge to polymer contact. Also, the flow in a traditional static mixer is more laminar than turbulent. The more laminar the flow the lower the Reynold’s number. In the three standalone pilots with The RapidFloc, Deskins has saved an average of 30% in polymer and increased hydraulic throughput by as much as 25% for these facilities. The Continuity Equation, Bernoulli’s Principle and Venturi Effect all work in concert to maximize its efficiencies. These principles and effects have working parts all interrelated to each other. Fluid finds the path of least resistance. The medial bar helps in that capacity and recirculates the polymer/sludge once again. Utilizing the Continuity Equation sludge/polymer moves faster through this bar because it is smaller than rest of the piping. The baffles positioned alternately throughout the RapidFloc create pressure drops resulting in higher hydraulic throughput and polymer mixing. The faster the flow rate of the sludge/polymer the higher the Reynold’s number as it relates to the viscosity of the polymer/sludge. Let's quantify this, the equation is-inertia force/ divided by viscous force. The higher the Reynold's number, the more turbulent the flow. This enables higher mixing values. This Deskins Trailer System has been in operation at this Winchester, IN WWTP since 1993. Actual hook up site to Deskins RapidFloc Mixer Winchester, Indiana's sand drying beds tracing back to 1993. As part of an award winning HNTB design in 1997, this RapidFloc was installed to mix polymer and clarifier influent to settle out solids in a clarifier. 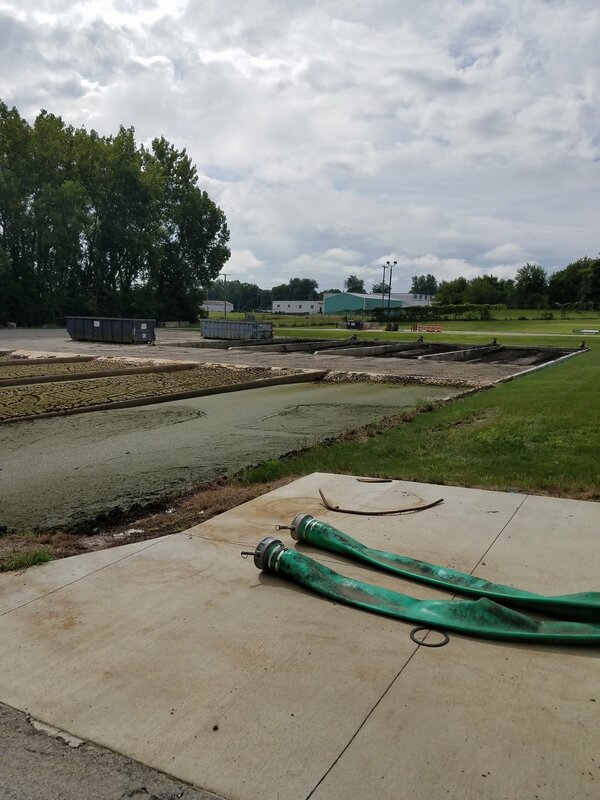 RapidFloc Technology has been utilized on these sand drying beds since 1993 in Lewisville, IN at South Henry's WWTP. Deskins RapidFloc utilized in Fishers for 18 years. The RapidFloc Mixer low risk and high reward strategy to dewatering sludge! Wouldn't it be nice to actually get much needed equipment for next to nothing? Wouldn't it be nice to actually get equipment to free up capitol? Wouldn't it be nice to get equipment in wastewater that provided you with a return on investment in under a year? I have some great news!!!! You can! The device is called The RapidFloc Mixer. This device has been installed as far away as Australia. The RapidFloc Mixer works wherever and whenever there needs to be volatile mixing in front of all types of waste water equipment-even clarifiers. We have seen up to 70% in polymer savings and up to 50+% in production. With our competitive interest rates we have arranged a partnership with a local bank to provide financing. Here is some math to prove my point! RapidFloc monthly payment $500/per month. Polymer cost your plant $2000 per month. RapidFloc saves your plant 40%=That's $800/month and you have covered your monthly payment with a surplus of $300! Here's more great news! $300 gained in capitol per month. You have increased the efficiency of the plant through better production reducing man hours. You potentially could increase dry solids and reduce transportation cost of your solids. You decrease wear and tear on your centrifuge, beltpress, rotary drum thickener or screw press because The RapidFloc actually mixes polymer and sludge with minimal headloss. Could straight line winds do this? Occam's razor (also Ockham's razor or Ocham's razor; Latin: lex parsimoniae "law of parsimony") is the problem-solving principle that, the simplest explanation tends to be the right one. In other words, when presented with competing hypothetical answers to a problem, one should select the answer that makes the fewest assumptions. The idea is attributed to William of Ockham (c. 1287–1347), who was an English Franciscan friar, scholastic philosopher, and theologian. This law applies to a plethora of aspects in everyday life and has strong implications in sludge dewatering. Anywhere from 30-50% of a facilities operating capitol is funneled toward sludge dewatering. A huge chunk of this precious capitol is geared towards polymer expenses. Another huge piece of pie in your pie chart is spent towards a dewatering mechanism. Ok you have to have a dewatering mechanism but you need to get the most out of it because it depreciates and it cost money to save money in the long term. What if I told you I could give you a device that actually appreciates in value and helps increase the value of your dewatering mechanism? The Deskins Rapidfloc Mixer is this device. The RapidFloc Mixer is a polymer reduction device, has no moving parts, increase hydraulic throughput of almost all existing dewatering mechanisms and can even increase solids percentage %. Does it sound to good to be true or gimmicky? No gimmicks here. Just simplicity. After all didn't the great Leonardo Da Vinci write something along the lines of: "Simplicity is the ultimate sophistication." So, follow the "KISS" formula and look into the RapidFloc Mixer and after you say to yourself, "Why didn't I think of that?" Apply Occum's Razor and choose Deskins wastewater/water dewatering equipment in particular the RapidFloc Mixer. A device that appreciates in value! A special "thank you" to Pat Gallagher and Todd Schnick of Water Online with Deskins-Product Manager, Erin Widner discussing Deskins.